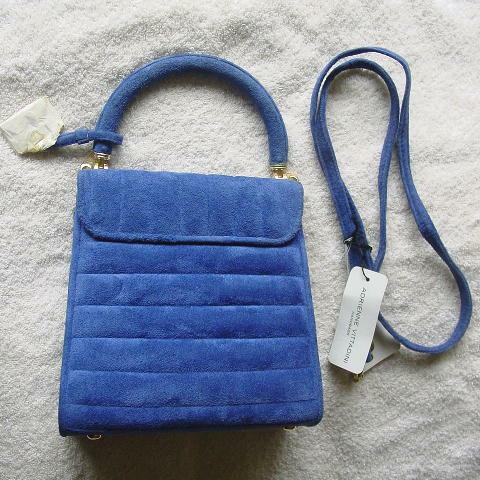 This never-used blue suede (genuine leather) purse is by Adrienne Vittadini. The front and back have a design pattern of 1" horizontal rows. The flap has the rows vertically and there is a hidden magnetic snap in the front and the flap extends 2" downward on the back. It has a black lining with a back zippered pocket. 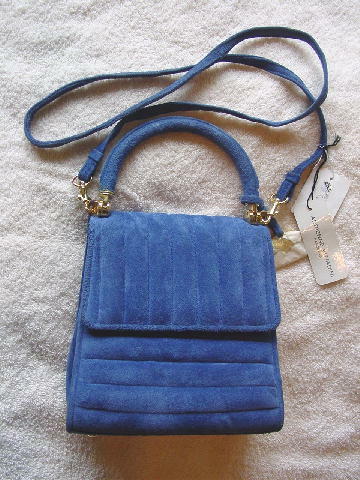 There is a detachable 41" long suede shoulder strap and an 8 3/4" solid based suede covered handle. The tags are still attached and the gold-tone metal logo tag is still covered in paper. There are 4 little gold-tone metal feet and there is a darker area on the right near the side seam. It can be worn from daytime into evening (remove the strap for evening wear). It's too small for her. She carries way too much stuff (mainly makeup).